I can be such a brat sometimes, perhaps it was the child within that makes me do foolish things at the wrong time, at the wrong place. It is often the learning process that matters right? My mom once said that I often play with my food when I was young and actually I still do but for a reason perhaps. 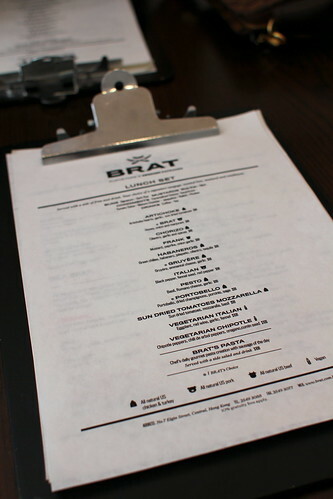 At the newly opened hot dog shop Brat, I can't help but rearrange my food for the sake of the pictures. For those who know me well, I love hot dogs but in Hong Kong, it is quite difficult to find a good one indeed. I was quite excited to find familiar sausage names on the menu, namely, Italian and Gruyere sausages! So many I wanted to try! For my lunch set, I ordered to the Italian for its lightly spiced flavors I miss so much back home. We can choose either the Rye or normal buttery bun with our hot dog, I picked the normal one because I think rye would make it quite hard to chew right? Quite tough to chew for a hot dog in my opinion. Give it a try if you want. The lunch set came with some fries and they were quite good, quite crisp! 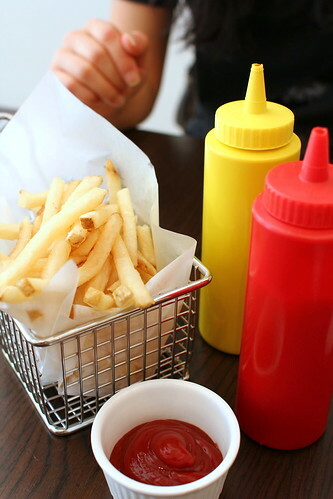 I love the metal container and of course the ketchup and mustard plastic bottle which I heart! Somehow the look and feel of them made the whole experience quite cheerful. So how was the hog dog in general? 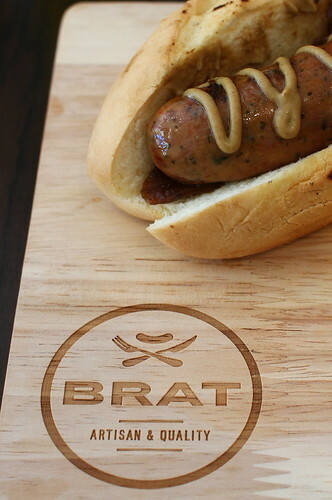 The sausage was good, spicy and flavorful as it should be but the size was slightly smaller than i expected. The lunch set was HKD98 including a drink and fries. In central / soho area, the price maybe reasonable perhaps and it is more than just the food you are paying for but the overall experience. 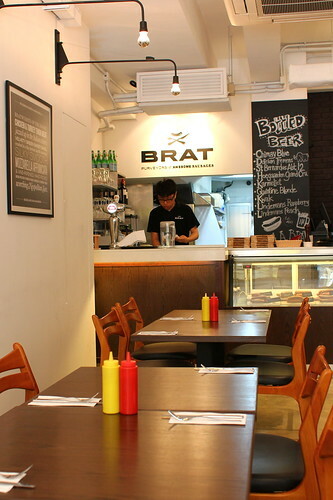 There are very few places in hong kong that specialized in hot dog and/or sausages so Brat has it niche for the time being. 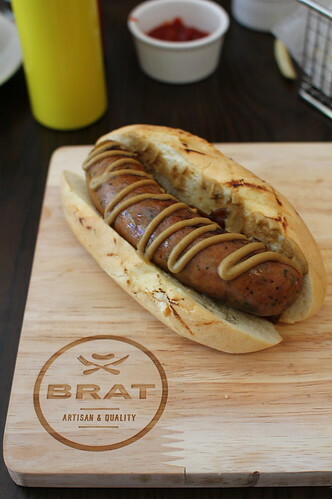 hot dog + sausage size quite small but then again delicate tasting size is the new large right? Have you tried Big Bite in North Point's Fitfort? Lots of people go for its burgers* but I tend to opt for its hot dogs. They're simply done but done well -- and I like their generous and broad condiments option range. Certainly there are many more pleasant times ahead for those who see your blog.